All views considered, answered and published. Associate editor John Ferguson for the THE AUSTRALIAN, news paper story, Such is life: quest for Kelly site is buried ! Lets hope not for the sake of all those interested in true history. With one foot on the fireplace rocks of one of the huts, not the grave, we stand for justice denied. From the authorities point of view, DELWP officer Nicci de Ryk is quoted as saying "Significant research over many years by individuals and groups has suggested a number of different sites as possible locations where events unfolded. Much of this research continues and remains contested" she said. Click on above image to enlarge. For the record, the inset map image in the hard paper copy has pointed the wrong Stringy Bark Creek near Yarra Glen. Following my meeting at SBC with DELWP representatives, I was emailed the document that Ian 'Charles, Walsh Nature Tourism' had prepared as a DRAFT for me as a stakeholder to consider. Well what can I say! Draft proposal for the of StringyBark Creek Historic Reserve UPGRADE. Naturally I think this is a very bad outcome if they can get away with it. They are proposing to white wash the whole SBC precinct so it will be easy to manage and in the process pull the wool over the eyes of every casual history tourist. Please don't sit on your hands and ignore this travesty. Representatives of Department of Environment, Land, Water and Planning - DELWP invited me to show them the Stringybark Creek sites. Following several country newspaper reports of pending upgrades at Stringybark Creek, there is a concern by people with an interest in the Kelly story and history tourism in general that the correct sites at SBC will again be wrongly signposted by DELWP. In fact, as I was to find out, the real issue is not that sites at SBC will be incorrectly signposted, but rather that they will not be identified at all (with the exception of the likely site of Sergeant Kennedy’s killing). In undertaking this project, DELWP invited input by SBC “stakeholders” and other interested parties. As a result of this invitation and given my knowledge of SBC, I was invited to an on-site meeting with DELWP’s Lucas Russell (District Manager - Goulburn) and Catherine Spencer. At the meeting I was informed that the proposed plan is to replace the current emphasis on Ned Kelly with a more respectful emphasis on the murdered policemen. This is to be done by way of new signage which is proposed to be erected around the existing circular signage shelter at the SBC picnic ground. Concurrent with this, DELWP’s plan is to remove the existing track which currently leads to the site on the east bank of SBC that Ian Jones incorrectly identified as the site of the police camp where Constables Lonigan and Scanlon were killed. I was also advised there are no plans to identify the correct site of the police camp (the “Two Huts site”) where these two men lost their lives, or to extend a track to this site. Although the correctness of this site can be easily proven, I understand this is partly because of claims by another group (the CSI@SBC group) that the correct site is at a different location. The following link is to a blog “Ned Kelly - Death of the Legend” where host Dee debunks a report prepared by the CSI@SBC team. The only track that DELWP is proposing to construct is one which will lead to the general location of the site where Sergeant Kennedy’s body was found. This is presumably the site I identified with Leo Kennedy back in 2014 (refer below to my previous News-update). It seems strange to me that the site of Kennedy’s death would be acknowledged but not the Two Huts site where Lonigan and Scanlon were killed, particularly given the correctness of the Two Huts site can be proven beyond a doubt whilst the Kennedy site is at this stage no more than the general location. I was informed by the DELWP officers that the reason for having a track leading to the general location where Kennedy was killed is to give visitors an appreciation of the distance that Kelly chased Kennedy down before killing him. However this will be misleading if the track is to commence at the picnic ground site because the distance is some 350 metres short of the Police Camp (Two Huts) site where the chase commenced. I believe most visitors to SBC would be most interested to see the actual sites where the killings occurred rather than just be presented with a generalized account of the events which occurred here so long ago. SBC is not the kind of place that people are likely to visit simply for a picnic. In fact, the DELWP officers indicated that the existing picnic tables and seats are proposed to be removed. Most visitors will therefore be keen to see the actual sites. I support the proposed change of emphasis from the Kellys to the murdered police. I think it would be appropriate for the sites at which Lonigan, Scanlon and Kennedy were killed to be appropriately acknowledged by way of a plaque or other form of monument. Not to acknowledge these sites would be a disservice to these men. And to acknowledge one of the men (Kennedy) but not the others would also be a disservice. Several years ago I took one of Lonigan’s great grand-daughters out to SBC to show her where he was killed. She was very emotional and couldn’t believe that the site was unmarked, and that another site (the Ian Jones site) had been incorrectly identified. The opportunity now exists with this present upgrade to correct this situation. Unfortunately the way DELWP is going it seems the upgrade is simply going to be some new signage that simply tells the visitor that something happened here some 139 years ago, without any guidance as to exactly where. One has to wonder really what point there would be in visiting SBC at all. For all those who are interested, here is a mud map of sites along SBC that I have not previously publicly released. The map was produced for Peter Fitzsimons to include in his 2013 Ned Kelly book, but was not used in the end due to a lack of color pages. Leo Kennedy asks Bill to help him locate Sergeant Kennedy's murder site. In 2014, I was asked by Leo Kennedy if I could help locate the likely spot where his great grandfather Michael Kennedy was killed by Ned Kelly. In 2002, I identified the correct site of the police camp known as the Two Huts site. This therefore was the only logical starting point in the search for the Kennedy site. After a careful reading of primary sources and analysis of the 1878 Burman photo taken at the site where Sergeant Kennedy’s body was found, I set out with Leo along the east bank of Stringybark Creek in search of the site. Bill (left) with Leo at SBC ready to explore every nook and cranny along the creek. After several days of bush bashing and measuring distances, we were able to eliminate a dozen sites along the creek. Eventually we determined that only one site was consistent with the Burman photograph and written descriptions. The site is located some 850 metres away from the Police Camp site where Constables Lonigan and Scanlon were killed. The photograph below shows Leo Kennedy at the site in front of a tree that I consider is likely to be the same tree which features in the Burman photo (see below). We initially decided not to publicize our findings in the hope that a proper archaeological investigation could be undertaken of the identified area. In this regard, it is likely that the shot that passed through the sergeant’s body would still be embedded in the ground and that a proper archaeological investigation could pinpoint the exact location. However in 2015 Leo and I accompanied journalist Lisa Clausen to the site as part of Leo’s quest for proper acknowledgement to be given to the three policemen killed at SBC. This resulted in a feature article “The true history of the Kelly victims” being published as a feature article in The Age newspaper on 11 April 2015. It was hoped as a result of this article that this would lead to the site being properly investigated and identified and ultimately signposted. Following the publication of 'The Age' article, we were contacted by Gene-pool, a film production company which was interested in taking on the Kennedy /SBC story. Unfortunately as much as I would like to have been involved in this documentary given my vast knowledge and experience of SBC, Gene-pool wanted to use the TV archaeologist Adam Ford as the SBC “expert” for the purpose of the documentary. It seems to me that the Gene-pool documentary may well identify the site of Kennedy’s killing based on the work I undertook for Leo Kennedy. Hopefully my work in identifying this site will be properly acknowledged. It seems to me however that if the site of the Police Camp is not correctly identified, then this will make the documentary historically inaccurate. It would be unfortunate on the one hand to correctly identify the site of Kennedy’s killing, whilst at the same time incorrectly identifying the site at which Lonigan and Scanlon were killed. Below: Bill stands by a most likely tree as in the Burman photo of 1878/9 as we believe this is the same area. 15 March 2009 Authorities hoodwinked. New Kelly Gang up in arms over shoot out site. Kelly expert historian Ian Jones is wrong about where the police tried to shoot it out with the Kellys in October 1878. 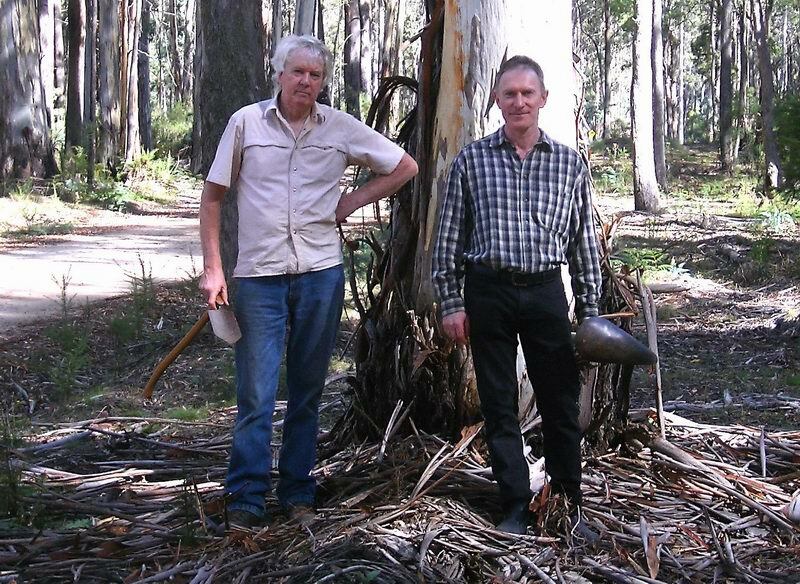 In his latest book edition on Ned Kelly, Ian Jones states that the site of two huts identified by Kelly researcher Bill Denheld in 2002 - are un related to the Kelly story. Bill's research shows one of the hut sites was the Shingle Hut that Ned Kelly himself wrote about in his Jerilderie Letter of 1879. Pictured Left, ascribed as the 'Bushrangers hut at Glenmore Ranges' meaning by the article featured in the The Australasian Sketcher Nov 1878, 'Ned Kelly’s hut at Stringybark Creek'. 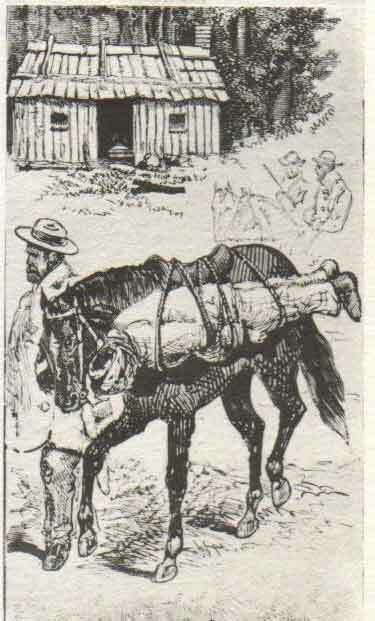 The image also shows the body of one of the dead policemen being carried out on pack horse - from the remote location in the Wombat Ranges north of Mansfield. The hut drawing is a montage of the tragic events featured in The illustrated newspaper Australasian Sketcher. Bill Denheld and Queensland Kelly researcher Greg Young, have concluded the Hut is in fact ‘The Shingle Hut', one of two huts as mentioned in the press at the time as where the police had camped, and we believe this is the only know image of the hut. Ian Jones, in his new book claims a Hut marked on the first map of the area in 1884 is some hundreds of metres north ( from Bill's two huts fireplaces site) which marks where the police had camped. But Bill has shown Ian Jones to be incorrect. This site identified by Ian Jones is unable to support photographic evidence of the police camp. An accurate survey by Bill using GPS has proven the original first surveyors map of 1884 has the hut incorrectly plotted in conjunction with where the police had camped and shot . Bill Denheld who has studied the shoot out site at Stringybark Creek north of Mansfield for the past 24 years and believes Ian Jones has set out to mislead the authorities like DSE, Benalla and Mansfield Historical societies, to create uncertainty of the true site and leave Bill's research out in the cold when it comes to signage and recorded history. Bill came across the true clue to the police camp site after studying shadow details for orientation of police forensic photos of the shootout site taken just after the police killings. At the time Two huts were reported as nearby, and during research by Bill in Sept 2002 with renown Kelly historian Gary Dean, Bill came across the ruins of one fireplace of one of the two huts near the THEN accepted Jones site police camp WHICH is proven to be WRONG. The Department of Sustainability and Environment (DSE) in conjunction with the Ned Kelly Touring Route ( NKTR) steering committee uses Ian Jones as their Historical consultant to promote the Kelly related sites for commercial tourism through out NE Victoria and Southern NSW. 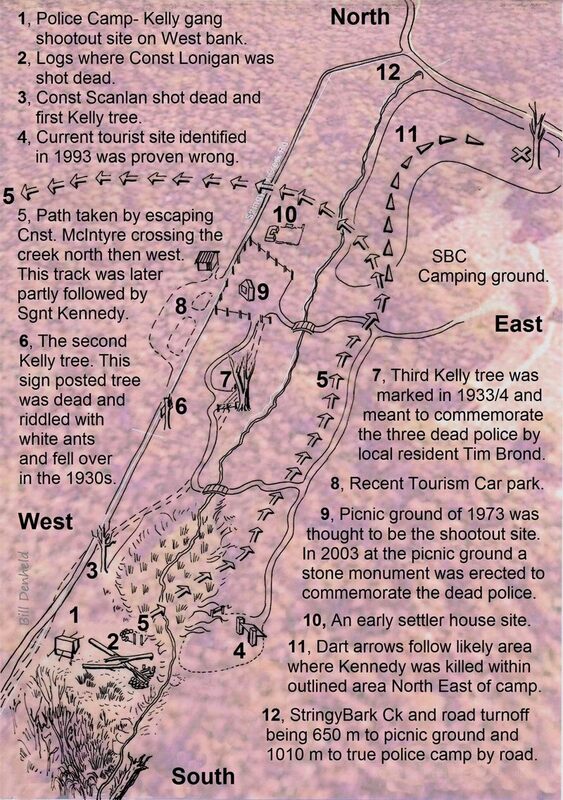 Bill Denheld's aim was to always bring truth to the story as for years the shoot out site at Stringybark was promoted as near the Kelly tree picnic ground. In fact the true site is 350 metres further up the creek. Good tourism must be underpinned by truth and fact. After five years of lobbying, the authorities have little option other than to show the true site and allow visitors be directed to the true sites starting with the police camp site. The DSE are in charge of the works under guidance of the NKTR plans to build / erect a viewing platform right in the middle of the police camp site where possibly two of the police troopers, Constable Lonigan and Scanlan were shot by the Kelly gang. Bill Denheld is up in arms since he first provided DSE with plans for the area because he was determined to allow the casual visitor to Stringybark Ck see the TRUE sites and not just the Kelly tree picnic area. " My plans were unobtrusive and were sidelined by DSE in preference to plans offered by Wangaratta NKTR promoters led by Ian Jones. With Mansfield Historical Society members, we offered to create simple raked walking tracks to and fro and historically accurate signage for less than $5000, but DSE totally ignored the plans in preference to what the authorities later drew up costing more than ten times that amount.
" Bill's plans were not used and he was not even invited to be part of a special Stakeholders Stringybark Reference Group led by Ian Jones. Final plans for the works went on public display in April 2008 and according to those plans no stone structures for people to stand or sit on was part of the works at the police camp. So they must have changed the plans without public notice or opinion regarding this historic site. Bill says Ian Jones, the eminent Kelly historian has hoodwinked the authorities into believing the true site is somewhere else, north of the Kelly tree when clearly he is wrong. The works at the true site have to be stopped. 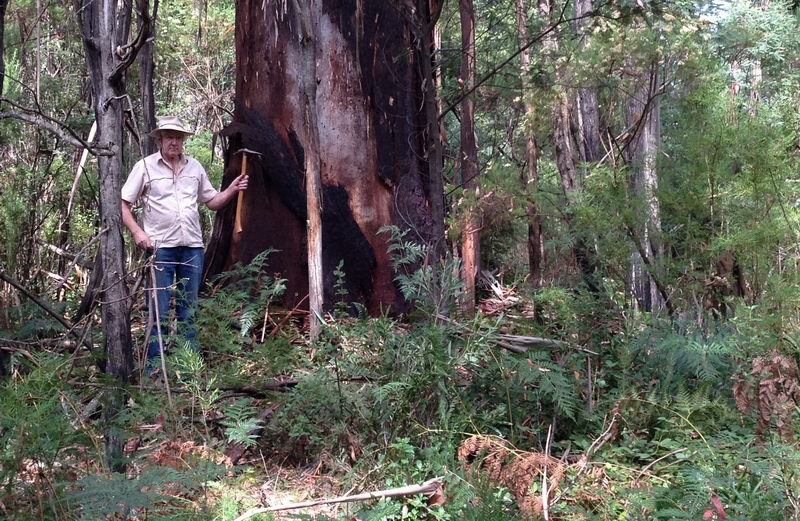 New battle at old Stringybark Creek - Written by HARVEY DIKE. 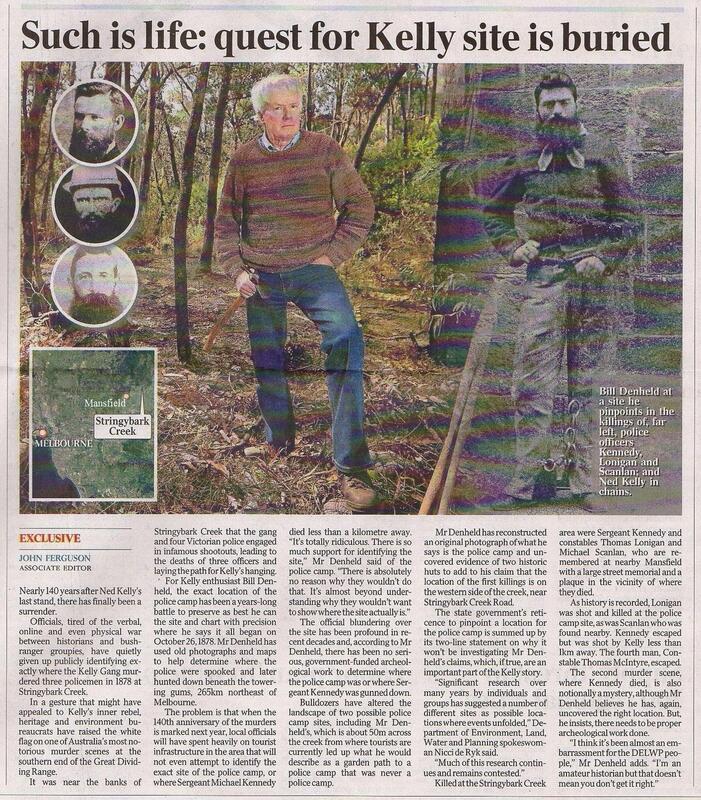 PLANS by the Department of Sustainability and Environment (DSE) to develop the Stringybark Creek site of the 1878 battle between the Kelly Gang and police have come under fire from a Kelly historian. At the centre of the row are disputes about the exact location of the police camp and the places Sergeant Kennedy and Constables Scanlon and Lonigan were killed, and the nature of the tourist development, if any, that should occur. Kelly researcher Bill Denheld claims that the DSE intends to pass on flawed advice to visitors to the site. "An 1884 surveyor’s map has the police hut incorrectly plotted, some hundreds of metres north of where I believe the correct site is, yet the incorrect site is the one tourists are being directed to," Mr Denheld said. "Stringybark Creek history is part of Australian folklore, history must be underpinned by the truth, and Stringybark Creek is now the number one site on the Ned Kelly tourist route. "The historian that the DSE is relying on is quite wrong about where the police tried to shoot it out with the Kellys." Glenrowan resident and Kelly historian Gary Dean said that the controversy surrounding the precise location of the police camp and the slain policemen would not be ended until a proper scientific investigation of the area had taken place. "There needs to be a careful and thorough investigation of the site, and until there is, the DSE is wasting their money by setting up the tracks and the platform," Mr Dean said. "All works at Stringybark Creek should be stopped. "They won’t last long anyhow, as the area is particularly prone to bushfire and vandalism. "What everyone can agree on is that the present Kelly Tree, marked as a memorial to the three murdered policemen, is the third tree to be so named, and is probably a significant distance from the first which was probably logged around the end of the nineteenth century." The DSE’s Goulburn district planning manager, Kathy Gosby, said that Mr Denheld had not formally produced his evidence and had not become involved in the process of the site’s development. "However, we did consider Mr Denheld’s point of view," Ms Gosby said. Another battle is being waged at the site of the infamous 1878 shoot -out between members of the Kelly Gang and police troopers. The Stringybark Creek site, about 50km east of Benalla, is being revamped to better cater for the growing number of visitors, while linking environmental and historical values. The revamp is a joint project between the Department of Sustainability and Environment (DSE) and Benalla Rural City, and is being partially funded by a $20 000 contribution from the latter and through the State Government's Living Regions, Living Suburbs program. But some people believe the revamp is obtrusive and destructive, and the site should be left in its natural state. DSE Goulburn district manager David Wells said a stakeholder reference group, made up of representatives of historical, community and indigenous groups, had input into developing the site plans. Professional input was also sought from the Victorian Police Historic Unit and DSE Heritage Branch, because it was considered such a historical and sensitive site. DSE's Goulburn district planning manager Kathy Gosby said completed works included a new carpark, land-scaping and walking-track improvements. "Once gravelled, the newly aligned track to the Kelly Tree will provide greater access for people of all ages and now caters for wheelchair access," she said. "During the next few weeks we hope to complete construction of a new toilet facility and install upgraded footbridges over Stringybark Creek." "Stringybark Creek Reserve is an extremely popular location and these works will both enhance the experience for visitors and protect the environment for the future generations," Ms Gosby said. During a tour and visit of Stringybark Creek and Kellys creek, Heritage Victoria archeologist Jeremy Smith said the site nominations will be included in the Victorian Heritage inventory. This will ensure permanent protection of the sites. The old fireplaces of two huts built by the first lease holders Heap and Grice in 1848 will undergo archaeological investigation, as one of the fireplaces belonged to the Shingle Hut that Ned Kelly referred to in his Jerilderie Letter of 1879.
archaeological investigation, nothing has been done. Benalla Rural City Council have secured $50,000 from the State Fire Recovery Fund to upgrade the SBC Recreation Area. DSE and the Council will be working together to improve visitor facilities and upgrade the site. The project will also include rehabilitation work to repair the damage caused by the bush fires. A Stakeholder Reference Group (SRG) made up of representatives of historical, indigenous, community groups and tour operators have also been invited to participate in this project. Kelly Ck track closure not good enough for elderly and disabled. This was the entrance to the Kellys Creek sawmill track 1930s. Before that, circa 1890's it was the road that lead to Stokes's and Mc Crum's place. On this road track stood the Kelly hut and camp of 1878. This track entrance is just 300 metres north of Stringybark Creek road turnoff. Heritage Victoria Site Protection Notice. NOMINATION OF KELLYS CREEK AND STRINGYBARK CREEK near Toombullup to THE VICTORIAN HERITAGE REGISTER. As of 5 May 2004, Bill Denheld has nominated these Kelly sites to Heritage Victoria for possible inclusion on the Victorian Heritage Register and / or on the Victorian Heritage Inventory. Under the terms of the Heritage Act 1995 it is an offence to disturb an historical archaeological site unless consent has been obtained from the executive director of Heritage Victoria. Further archaeological work at these sites is planned under guidance of the Heritage Victoria. Please be aware that the disturbance of an archaeological site, and the collection of artefacts, constitutes an offence under the act. Stringybark and Kellys Creeks are managed by Parks Victoria, under guidance of the Dept of Sustainability and Environment D.SE formally known as Dept. Natural Resources and Environment D.NRE. With high community ' Kelly' interest, it should be commended that six local government municipalities are currently developing the Ned Kelly Touring Route.
" The route will intrinsically link the key 'Kelly sites' in North Eastern Victoria and Southern Riverina with an appropriate brochure/map and to install high quality interpretive signage at relevant sites to allow visitors the opportunity to gain a greater insight into the Kelly legend." These tourist developments, will direct visitors to the very places where all visitors want to be, where it actually happened , including - Kellys, Stringybark and German's Creek, for it was from here the gang evolved. Given that we are faced with deciding how to protect the past and important historic places with many thousands of visitors coming to Stringybark Creek annually there is a need to plan for future generations. Just how this should be done requires much foresight and determination right now, not when its too late. Unfortunately as can be demonstrated, it was time to instigate Heritage nomination and recently the removal of the Kelly tree log for safe keeping. We are very fortunate that for the best part these actual terrains of the Kelly story are still much as they always have been, undeveloped, and hope it remains that way. We must all tread carefully to avoid destruction of what we came to see. It is therefore the duty of each and every visitor to leave these places exactly as we found them. Remember, Stringybark Creek is sacred ground, when there - respect the past for the future. PS, Do you have a point of view on these matters? Please let me know. It has been known for generations that a portion of a Kelly target tree lay in the creek rotting. 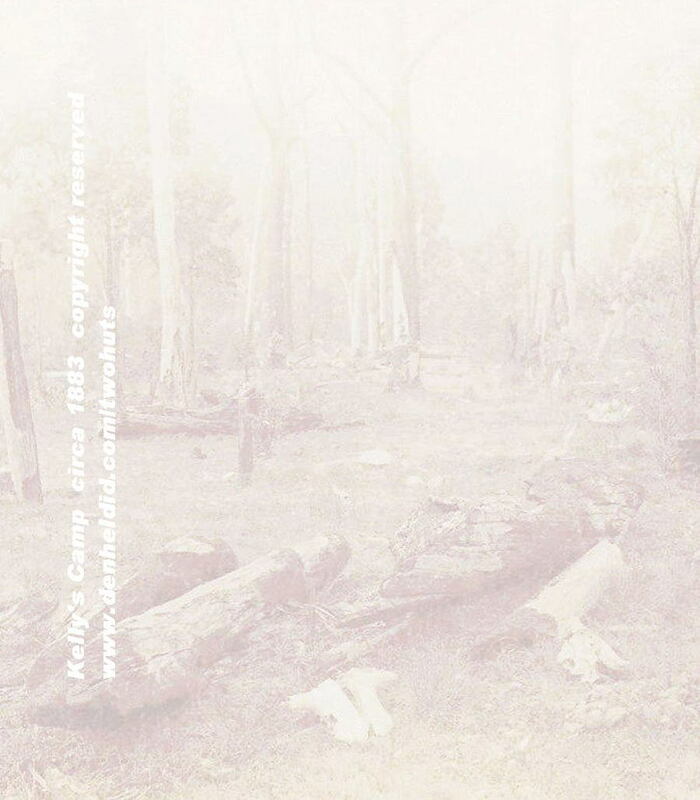 Over a twenty year period it had become very fragile and the next bushfire would certainly have been the end of it. That would be very unfortunate and a great loss, but when visitors actually start sawing off pieces, we need to draw the line. I first saw the log when well known local historian ' Mr. Bill Stewart' pointed it out to me in 1985. Being the only tree log stump with a direct connection to the Kelly gang and at great risk of being lost forever, I initiated its removal for preservation. Pictured left, D.SE historian Daniel Catrice and myself at the Kelly target tree log. I had first seen the log as fully round that you could stand high upon. It is now a mere shell, a giant peppermint gum scared by eons of time, shot at and chopped finally to be dropped for either firewood or curio. Left, At the depot we examine the remains of the Kelly target tree. The removal was the instigation of myself (at left ) seen here with Mansfield Historical Society historian Sheila Hutchinson, Kelly historian Dave White, Kelly researchers Nicole Jones, and Bruce Johnson at right. Photo, Joe Hutchinson. Being the last Kelly relic with direct connections to the Kelly* gang's shooting practices prior to the shootout with the police at Stringybark Creek in 1878, the tree stood within a stones throw from the Kelly hut and like other trees nearby were the brunt of thousands of rounds fired to improve their shooting accuracy. The relic will eventually go on display at the new proposed 15 million dollar Ned Kelly Visitor Centre at Glenrowan when it gets built. The tree was still standing up to 60 years after the police shootings while even a sawmill was operating there, they did not touch it. During the 1940's the tree was dropped and large parts were cut from the giant log. Chainsaw marks are testimony to that. The tree relic is to be kept in a safe place till an interim public display place can be decided upon. Note, * The Kelly Gang did not evolve till after the shoot out with the police at Stringybark Creek. Before that event the Kelly brothers were only wanted men. Ned and Dan Kelly with their friends practiced their shooting accuracy at the Kelly camp on Bullock Creek, and this tree fragment was one of their target trees. During May 2003 Bill Denheld was asked by the Dept of Sustainability and Environment to call a meeting regarding the status of the Stringybark Creek Police camp and Kellys camp site at Kellys creek. All interested parties are invited to be present including the responsible authorities. Sheila Hutchinson, Bob Bretherton, Gary Dean, Matt Shore, Brad Web, Brendan Pearce, Dave White, Ben Collins, Marian & Peter Matta, and from D.S.E, David Hurley, Terry Kingston, David Wells, and the historical officer for D.S.E, Daniel Catrice. Each was asked to nominate invitees and advise on a management plan. To put in place a protection plan for both S/Bark and Kellys Ck. The NRE needed to know where the historically important sites were for proper management and to avoid burning those by mistake. Meeting outcome. Undergrowth to be cleaned up by work parties. No marking of original sites to be done until after a proper archeological study has been carried out. The sites are to be recommended to Heritage Victoria as historical sites worthy of preservation under the Heritage Act. Matt Shore, Brad Web, Brendan Pearce, Dave White, Ben Collins.